More than 1,800 unclassified spacecraft are being tracked as they orbit earth, according to Space-track.org, the public data base for such items — they are communicating with receivers on the ground as well as one another. 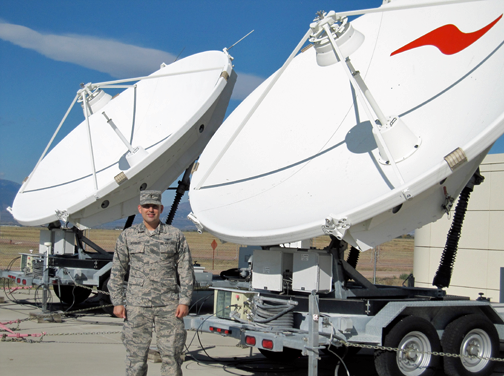 Who is watching to make sure none of those signals are nefarious, aimed at disrupting communications between the satellites and the warfighters in various theaters who rely on those signals to conduct their missions? 2nd Lt. Dan Vasquez, 16th Space Control Squadron crew commander, along with some of the equipment used by the 16th SPCS, Oct. 20, 2017, at Peterson Air Force Base, Colorado. The 16th SPCS defends access to the space domain by identifying, characterizing, and geolocating sources of electromagnetic interference on U.S. military and commercial satellites. Photo is courtesy of U.S.A.F. 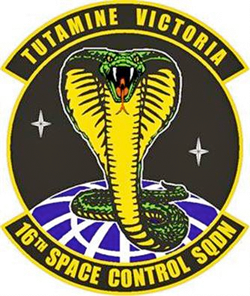 The 16th Space Control Squadron, located on Peterson Air Force Base, Colorado, is monitoring the situation. The squadron is at the forefront of the Air Force’s defensive space control efforts, utilizing multiple weapons systems with a nearly global reach in defending critical satellite communication links. The 16th SPCS defends access to the space domain by identifying, characterizing, and geolocating sources of electromagnetic interference on U.S. military and commercial satellites. That means the squadron externally monitors signals being broadcast, but does not listen in to the broadcast. Airmen from the squadron operate defensive space control weapon systems in-garrison from Peterson AFB, as well as, deploy in combat-ready crews to employ defensive space control capabilities for theater combatant commanders. Defensive space control capabilities supplied by the squadron have protected satellite communication links used by carrier strike groups, B-52 bomber missions, and special operations forces operating in the harshest locations. The 16th SPCS doesn’t have a main customer for the data it gathers. In fact, the squadron disseminates information across a wide spectrum of services and not much can evade their detection. “Who we provide information for is pretty spread out,” Vasquez said. Because equipment capable of transmitting UHF signals is fairly inexpensive and very portable, the 16th SPCS detects signals of interest from all over the globe and sends reports accordingly in support of resolving instances of electromagnetic interference. Vasquez has a bachelor’s degree in mechanical engineering. His education gave him a basic knowledge of the technology used in the squadron. He discovered he would be a space operator a couple of weeks before the completion of officer candidate school and attributed good trainers, and training, in helping him bridge the gap and do his job effectively. His primary responsibility as crew commander is ensuring his crew is situated to support defensive space control requests from multiple areas of responsibility during the course of his shift. Central to that responsibility is getting crew members motivated to be effective in their jobs and ensuring all space control event reporting is accurate, addressing all requirements outlined by theater combatant commands. Crew sizes are between two and four members who work as a unified entity. “At the end of the day, if your crewmates make a mistake, we all make a mistake,” he said. A day that could be considered as normal would be a luxury for the 16th SPCS. Each day brings a variety of situations demanding different responses. As a matter of course, Vasquez said he first assures his weapon system is properly configured to meet the variety of taskings he will be responsible for throughout his shift. When the end of the shift comes there is reporting to be done. Vasquez, however, has a more succinct interpretation — “We are saving the world, one day at a time,” he said.